Our town has had enough with the old funerary traditions that would make your skin creep. It’s true that the death of a child wouldn’t affect them, and in the end, they said: “angels always go to heaven”. This is what happens when a child dies; it was reason of celebration with music and dance. Therefore, for the older folks it was a different story. The death, took a different way, like a creepy manner, as it wasn’t something natural to grow old and watch your body bend over in search of Mother Earth’s warm embrace. This happened because older people’s souls, tend to be a nuisance and bother the people from time to time, and it was never know why, but a child’s soul, always had unfinished business and needed the help from the living to “move on”. The death caused many fears and worries, he-cause the popular tale, give away terrifying stories about phantoms and appearances that were told by a insane person of the house and said tales about all kind of apparition and ghosts, which were repeated over and over again in family and friend reunions after dinner and for more effect when torrential rains were falling outside, making the fireplace seening warmer and inviting to sit around and listening to the stories. The children’s bodies were taken along the main road, sitting in a chair, exposed to the people. Sometimes their faces would twist into some shape of grin, because the tense muscles, especially when the death happen after a long and painful sickness. When this happened handkerchiefs were tied around the child’s mouth. Musicians would play along side the vehicle, playing either a violin or clarinet. When it was a funeral from older person, also the body was exposed to the public, but was dressed differently, because relatives had usually being drinking the night before the funeral and there was sometimes very drunk, specially if the sick left a fortune to inherit. Candles were lit up and left to burn, because they were “souls”. “The angels” have that right if the family had money to perform a large ringing of the bells. These funeral parades give goose bumps, the month of November gave much dismal sense to the mourning. 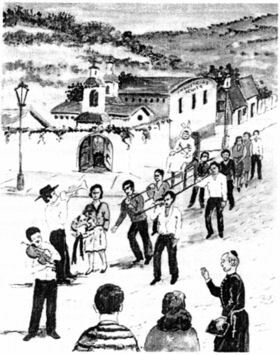 From the day before, the day of all the Saints, it was very frequently to hear the double ringing of the bells and on November 2n that is the “Day of the Dead”, the double ringing continued. There are specialized people in charge of the bells. Generally, individuals invited for other works, served as sacristan and attended as a replacement of the bellboys. 1 haven’t forgotten Poiicarpo Badilla the best bell ring of my town. His legs were broken in several parts, and to stand up he used a cane to help him. Nevertheless, he would climb the stairs with great enthusiasm up to the lower, which was the highest floor of the church. There he felt taller and more distinguish. Therefore, the height didn’t bother him at all. After this morning obligation, he tended to his former job as tailor. The town referred him as the “Bell Ringer”. Handy man; honest and very poor, who took the natural tolerance with patience and he accepted as God’s will of his physical defects. The Bell Ringer was the giver of gratitude, on the eve of the month of All the Saints and of course on November second, he doubled the night. His arms grew tired from ringing the heavy bells and he performs this task in shifts, the important part was being elected to double the night. This people were very concerned about the Purgatory Souls. Devotion as any other. They contributed with large pots of food as corn, plantains, (Chayote) plant and fruits, vegetables, and lacos, which were given with col-fee. Only those who work were allowed to have this snack. To deserve it, more than one child, abandoned their daily laziness and served as bellboys from time to time. It happened that sometime it had been noticed that there were many young bell ringers and a few baskets of snacks, and the old saying was “many souls, but little blessed water”. One day the infantile curiosity carried us out to ask which what the highest post of the village’;’ And hey would respond with an air of satisfaction that made us understand the inside pleasure of knowing that one is responsible for the job, and it’s to carry out with love and devotion. There are no humble jobs. Every job gives a science of responsibility of those who work with them. November is the month of the souls. A century ago it was a custom to take souls out of the Purgatory. The smal! activities weren’t enough, not the candles, not the masses, and not even the array of Gregorian mass. And so, the task of taking souls out of the Purgatory continues. It was a simple procedure, however impressive, consisted in a night parade, carrying lanterns on a pole. On each side of the lantern there was a skull and crossed bones. Throughout the parade and all along the way the church bells rang in persistent way. When a picture of the purgatory was at hand, something like a dainty vision, it was added. The faces tormented by an eternal flame were even more sinister Charity for the souls in the holy purgatory, “for the love of God” voices like whispering were asking for charity. And the people who have heard the bells ringing opened their windows and doors to watch the parade passed by. People from the parade would approach the viewers and ask for donations and charity. Once in a while a caring hand would hand out a coin. After all, we all have a soul to feel guilty’ about and needed a pray for their souls. When the donation was received, there was another verse added in thanks. first step, to get to heaven. you shall avoid me from being burned. Those were other times though. No longer is there the horror in seen the dead. Even the cemeteries, has been modernized and have taken on the looks of an old English Park. Little woods and chapels make it cheerful and the chirping of the birds gives an echo of sweet orchestral melodies. Life and death merge nicely. The same goes for pain and happiness, forming the same life. That is why in November, the month of memory and pain, is followed by December the month of carols and halleluiahs. Whoever conceived the calendar plan, most certainly had in mind that life and death complementing themselves in their death. On one and another the light and senses dignify them. We live to die, and maybe some day, we will convince ourselves that we die to live eternal life.